Over the past few years I have seen Laura Cheadle and her Family Band about four times, but I rarely had an opportunity to write anything about her save a short profile that came out in the City Arts back in 2011 (it was a series of short pieces on up-and-coming new voices in jazz and blues – you can check it out here http://cityarts.info/2011/05/03/laura-cheadle). Four years on, she has continued her pursuit as an independent artist – she partly relocated from Philadelphia to New York and has appeared in various locales here since then. She has not abandoned her hometown completely, as she explains in this e-mail interview conducted during the last week of February. Cheadle has a great funk and blues-inspired sound. Backed by a band mostly formed by her family members under the direction of her father, keyboardist James Cheadle, she belts out original tunes with a very personal feel. The musicians are very tight – they have been performing together for many years, and there doesn’t seem to be any ego battles there – they seem extremely happy to be doing this together. You moved from Philly to NYC – what made you make that decision? I am actually in Philly half the week and NYC the other half so I get the best of both worlds and cities 🙂 I’ll always be a Philly girl but the allure of New York City is so seducing to my soul. The magic is incredible. I am also meeting so many amazing musicians and opportunities here. I love both cities in different ways. Your “Family Band” – how did that come together? And how do you keep everyone’s egos in check since you are the front woman? It’s just been completely natural for us. I literally was four years old when I began singing with my family. We are unbelievably close and it just feels natural. I know most people would think that we have egos with each other, but we don’t. Performing together is the same as eating dinner together.. It’s natural and pure. Your father has long experience as a musician and arranger. How does his experience play in your music? This plays a large part in my music! My dad is an incredible musician and not only performs with me and plays on my recordings, but he also records me in his professional studio and produces my albums. On some of my songs, he is playing every instrument. I am extremely lucky to have him. He has taught me since a young age about the details that go into making real music. Ever since I was a baby my Dad has been playing and recording music around me. He used to take me to his studio and work with me right there in my toddler chair. I remember The Soul Survivors rehearsing in our basement when I was little and so many great musicians have passed through our houses through the years. My Dad always had a recording studio in or near the house and my brothers and I were always encouraged to participate in whatever capacity my Dad would want us to. I sang on many of his tracks and got to see him work and so understood the whole arranging/recording process firsthand. You have a new album – how is it dealing as an independent musician with the dramatic changes in the music industry? Do you think the current formats – Spotify, iTunes and Rhapsody, for instance – are doing a service or a disservice? It definitely is hard, especially when people listen to you for free. However, for people to learn about you, they must listen to you. A positive side for me is that a lot of people come to my shows and still buy CDs in person . My band has always been a band where people come and dance and I’m very thankful that people continue to come and support our music. What are your main influences as a songwriter, and principally as a singer? As a songwriter, I have always idolized James Taylor. I feel like he writes in a way that makes you nostalgic for an experience that you have never had. Stevie Wonder vocally has always been the ultimate inspiration. He sill can sing better than ever . New York seems to be becoming less and less welcoming to indie artists – so many venues have closed, and club owners refuse to take responsibility for their own clubs – how do you deal with that? I have actually felt the opposite of this. Since being up here often, I have joined local groups of songwriters and jams that are extremely supportive. The clubs I am playing are also paying very well. I know not all of NYC is like this but there are many communities that support the arts. One of the best parts of NYC is the unknown and how you can meet different artists and learn about hidden gems or venues at any given time. It really puts a smile on my face when a musician has the ability of not taking himself too seriously while still having the ability to create a wonderful work of art. There are many examples in history – one that comes to mind is how The Beatles were able to call themselves the ones with “the big fat hairy heads” on a British TV show – something that clearly endeared them to their audiences. You rarely see that in jazz, though. Maybe because of all popular music forms, it is the one in which the artists want most to be respected for their skills and musical ability (sure, all do but you’ll probably never see a jazz singer doing a promo in drag like Queen did in the 80s). But sometimes the magic happens, it’s a wonderful thing when it does. 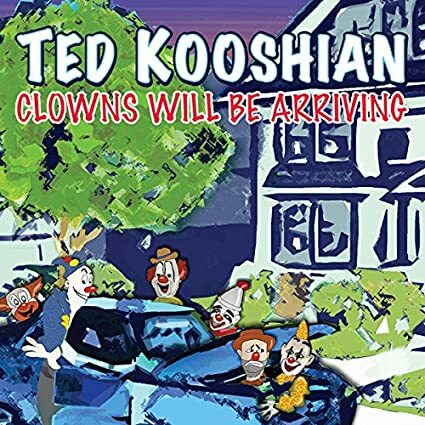 Which brings us to pianist Ted Kooshian’s incredibly amusing “Clowns Will Be Arriving,” (Summit), a mix of original tunes inspired by old comic strip characters and reinvented takes on classic TV show themes written back in the day when screen and TV composers were getting inspiration from Henry Mancini to write their own themes – all who draw inspiration from jazz in the first place. The album opens with the theme from “I Dream of Jeannie” – its Latinesque feel allows for lots of improvisation, and you can feel how much fun the musicians were having in the studio. “Get Smart” begins with a Booker T & the MGs feel via the bass and keyboards, and then evolves into a more straight ahead piece featuring the bandleader and saxophonist Jeff Lederer, who steals the spotlight with a soul-intensive tenor solo. Also notable are the covers of Wayne Shorter’s “Three Clowns,” played here with great sincerity, and the playful take on “Lost In Space,” which includes a Theremin-like keyboard and some electronic sounds inspired by the original recording. Among the originals I enjoyed both the bluesy “Porkypine,” a track that also gave the musicians a lot of space to be creative and the up-tempo “Ignatz,” which features both Lederer and drummer Warren Odze. This is a really fun album to listen to from the very first track all the way to the heartfelt arrangement to “When You Wish Upon a Star,” which Kooshian plays as a solo piece on electric keyboards. 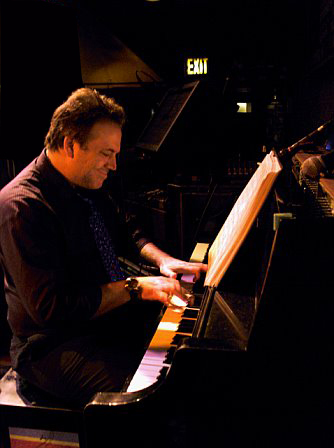 On this tribute to the music of Thelonious Monk, Bay-area pianist Alex Conde brings the music of the late composer into the world of flamenco. He doesn’t, however, simply Latinize the music (like many have done before him to various degrees of success) but instead takes the music to a different place on a brilliant album that was partly financed by crowdsourcing. “Played Twice” begins with flamenco percussion followed by Conde’s fluid, syncopated piano lines. The highly uptempo arrangement is quite simple, featuring just the bandleader, percussionist John Santos and bassist Jeff Chambers. The tune gives Conde ample opportunity to improvise and interact with the percussion in an incredible manner. The music is complemented by foot stomps and handclaps by Amparo Conde and Carmen Carrasco, who fill a lot of the song’s open spaces. “Think of One” is played with an accomplished Latin feel at first, but then evolves into more of a contemporary jazz direction, with the rhythm section formed by Chambers and drummer Jon Arkin with a brilliant solo piano middle section. Though I have heard countless takes on “Round Midnight” (one of my all-time favorites being Bobby McFerrin’s recording for the soundtrack of the movie of the same name). On his version, he begins with a classically-inspired solo intro and then continues solo, playing with a flamenco tempo on his left hand while taking some improvised notes around the melody after playing the head. I also enjoyed “Evidence,” here given an Afro-Cuban feel with the full quartet. It is sad (at least for me) that most of his upcoming gigs are in the West Coast – would love to hear this in a live format. I think I will start planning a trip out west sometime soon – there is plenty of interesting music going on out there these days.